The Craftsman Ethic: "It looks like what it is"
Recently over on Places we had the chance to interview Matt Urbanski of MVVA about the building of Pier 1 of Brooklyn Bridge Park. Check out the interview if you want, and for a more intelligent and expansive take on the entire project read Ethan Carr’s essay on the subject (but forgo Ourroussoff’s critique of it, which is complimentary but oh-so-vanilla). 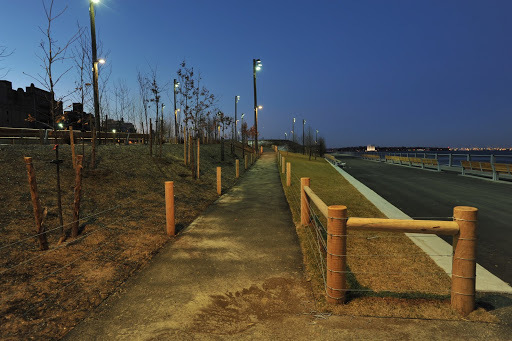 In doing research for the interview, we were smitten with the simple sophistication of the details of the place, especially the wooden elements of the park- the light poles, the fence posts, the building cladding, and especially the wooden benches. So, we jumped on our high horse FASLANYC-style and tracked down the man who helped make them happen in order to gain a little more insight. Now, we should acknowledge that though we spoke with what we consider the point man, woodworker Hector Ducci, but there were many folks involved including salvage specialists MFine who worked with MVVA. 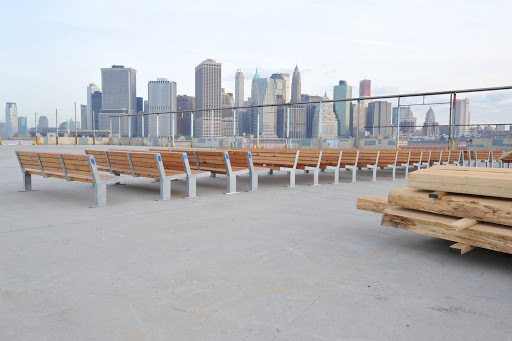 Each of the wood elements on Pier 1 is distinctive and striking for a New York City park. The wood of choice for parks here has historically been ipe because it requires no maintenance and weathers handsomely once it is ripped from the Atlantic Rain Forest and shipped from the Southern Hemisphere. 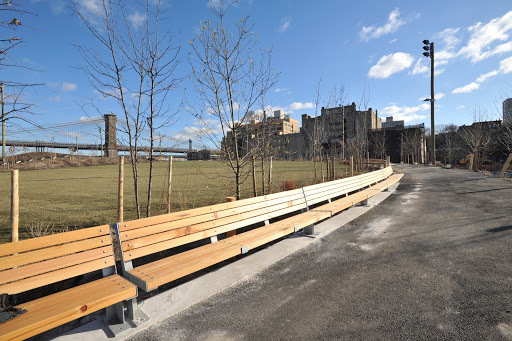 In Brooklyn Bridge Park MVVA used black locust, telephone poles, and the 100-year old southern yellow pine salvaged from the defunct cold storage warehouse on site. We talked to Hector to try and get the backstory on each of these applications. What we got was a ton of facts and anecdotes from a man with a real respect and genuine curiosity for wood. It’s a snapshot of the dialectic between concept and material, one of the major themes that defines Brooklyn Bridge Park; and we have shabbily reproduced that for you here. The benches of the park are particularly illustrative, especially when compared to the benches from NYC’s other recent high profile dandy- the High Line (first phase). 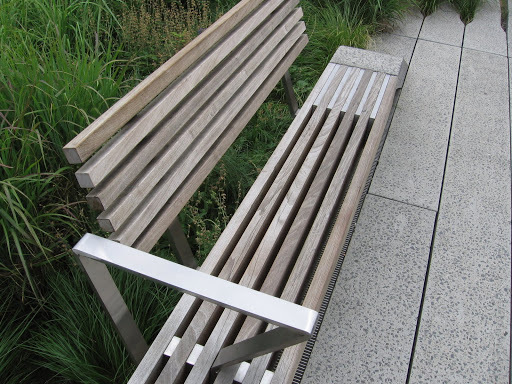 The High Line benches are stylized elements made from ipe, stainless steel, and concrete. Like so many salmon swimming upstream they spring out of the paving, emphasizing the linearity and movement of the space with delicate little combinations of precious materials. They are also an example of the material properties of a medium being completely sublimated to the stylistic notions of the designeratti (and hence will look dated, not to mention busted, in 5 years). This causes serious problems. The use of ipe is understandable though uninspired. It is an example of working within accepted, misguided city policy in a rote manner. 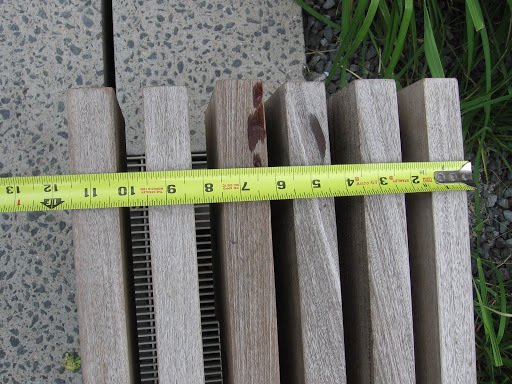 The 11.5″ seat module, derived from the width of the pavers, is too thin to be comfortable for long, and the boards turned on end and cantilevered 18″ leaves the ends prone to warping and chipping. Lastly, the single stainless steel armrest is guaranteed to scald that tender underside of your forearm on a summer day. While comfortable seating may not be a high priority on this promenade meant for strolling and movement, the damage and wear evident after less than one year of use suggests that more rainforest will be shipped to New York shortly to replace these fancy, delicate things. 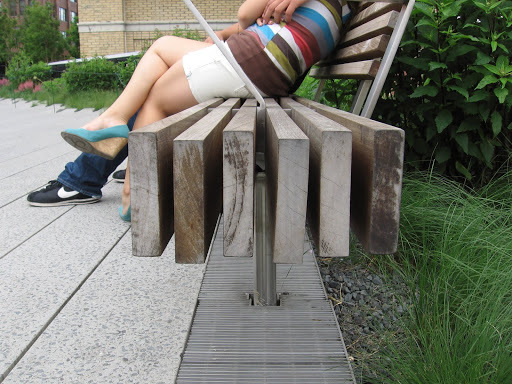 At Brooklyn Bridge Park the benches were conceived by MVVA as a site specific adaptation to the standard NYC park bench- wood slats bookended by a metal frame and used to delineate pathways. 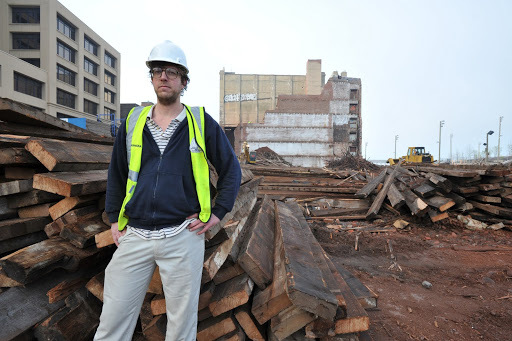 When it was decided that the cold storage warehouse on would be removed (though it remains to be seen why it couldn’t have been reused), Hector Ducci teamed up with MFine to take on the task of coordinating the demolition, salvaging, and repurposing of the wood beams and joists for use in the park. This material was recognized as a valuable and irreplaceable resource- the designers and craftsmen were tasked with creating a bench that would last 70 years. The density and resin of the old growth southern yellow pine gave it the tensile strength that allowed for long spans and the durability suitable for outdoor use. Hector knew that southern yellow pine had been used for centuries in the boat building community and started talking with them about the best way to use the material. MFine did the dirty work of extracting the nails and preparing it for milling. Hector then worked with fabricators and MVVA to test different options and figure out the ideal profile for the bench planks in order to minimize waste and provide maximum durability and beauty. Each piece was milled and cut to vertical grain so that water and sunlight would not cause rotting and splintering in the planks over time. Vertical grain and quarter-sawn timers are important to consider in working with any wood, but according to Hector it is critical in determining the longevity of southern yellow pine because of the high amounts of resin it contains. The work was arduous. Hector explained that as the different methods for milling, manufacturing, and fastening were being explored, “the material was showing itself through the process; we were getting feedback from the park itself. I have a close relationship with MVVA and sometimes they hated me because I would call them up and say, ‘Guys, we have to make a change, we have to use the wood this way.’ It is a difficult way of working, but difficult is good; it’s beautiful, and it’s closer to the truth.” The appreciation of the poetics of the material is perhaps particular to people in the trades that work closely with certain materials (or perhaps it’s because Hector is Chilean). This approach was also evident in the use of black locust for the fence posts in the park. Before the proliferation of pressure-treated lumber and prefabricated materials in the 20th century black locust was one of the most important trees in North America. Because it doesn’t rot and grows vigorously when young it was widely used in boat building, fencing, and construction. It’s grain is beautiful and it weathers a nice grey just like the ipe. However, it is a bit harder to work with than ipe or pressure treated wood. Because the older trees aren’t usually straight it is difficult to get large pieces of lumber that art straight. The wood must be slowly dried to make sure it doesn’t warp. Instead of dealing with this, the building profession have generally decided to take the easy way to the detriment of South American rainforest and the ground where the pressure treated lumber leached its potent cocktails. A quick aside for a black locust tangent. It’s derided as a something of a worthless weed tree, one that Gary Hilderbrand has classified alongside the infamous ailanthus, or as it’s known in Detroit, the ghetto palm. That’s too bad. As F.A.D. and Mammoth have recently noted in the reading of the ragged “Tree Huggers” chapter of The Infrastructural City, the broad characterization of species not traditionally valued for horticultural aspects as weeds stigmatizes species such as black locust. In addition to the usefulness of black locust in building, and the fact that companies such as Black Locust Lumber work to harvest these trees in the city when they are scheduled for demolition, black locust is also a nitrogen fixer, grows vigorously when young, provides shelter for wildlife and provides hollows for birds. In short, it’s a great land reclamation tree for degraded urban sites in the Eastern US, especially as part of a larger replanting/reforestation strategy. What’s more, they are not tolerant of shade and so are often crowded out by larger species once they have enriched the soil by fixing nitrogen and paving the way for traditional hardwoods. At any rate, what becomes evident talking to Hector is that the elements are not designed as a didactic celebration of some material or history, but an appreciation of the materials and the processes that render them useful. These effects on each element making up each space in the park in turn impart a texture, a primal quality. It is best achieved by working with the people in the trades. In our headlong rush to incorporate planning into our scope of work, we must hang on to the role of generalist-craftsman too.